Karate Belt Ranking Made Easy! Karate Meditation Exercise Helped me Get Out of My Body! Learn Karate on DVD to get the Best Martial Arts Instruction! Perfect Karate Form Can Be Achieved With This Simple Secret! What is the Real Value of Doing Karate Forms? Is White Crane Kung Fu the Missing Karate Link? The Transition from Kung Fu to Karate. Where Real Karate Came From! Karate Side Kick is the Most Powerful and Sneaky Kick Ever! Karate Wheel Kick Must be Done Right to Work! The Karate Kick: Four Ways to Build Massive Power! How to Get the Martial Arts Gun Fighter Mentality! Karate Fighting Concepts that Win Every Fight! Kickboxing Karate: The Three Techniques That Will Win Every Street Fight! Ed Parker, Karate Pioneer, or Opportunist? Karate Instructor Tricks That You Must Learn! The Toughest Karate Master Who Ever Lived! Yoon Byung-In: The Karate Sensei Who Could! Old Time Iron Fists Create Power Karate! 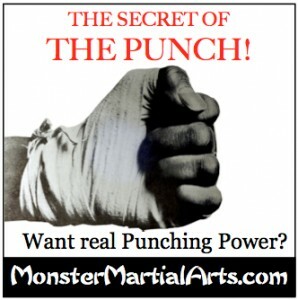 The Karate Punch…Which of the Two Punches is Better? 0 Karate Systems Lined Up in Correct Order! American Karate System Saves a Life! Karate Technique from Pinan Three Kata Builds Ki Power! The Truth About the Development of Classical Karate! Martial Arts Freestyle…and my karate instructor told me to raise my hands and defend myself. It was the karate lesson to end all lessons, and I was bruised and beaten and generally pummeled. Interestingly, if I had understood three simple, little things, the lesson wouldn’t have been hard…it would have been juicy. The first thing to be considered when you learn martial arts fighting techniques is distance. The simple rule is: if you control the distance, you control the fight. The following rules can be applied to learning martial arts freestyle in any art, including Kenpo, Taekwondo, and so on. A simple martial arts freestyle drill to help you do this is to face your partner at a distance you both agree on, and then, no matter where your partner goes, move with him to keep that exact distance. Front to rear, left to right, you maintain that distance. And it works best if you can match his footwork; if he moves his right foot towards you, you move your left foot back, and so on. The second step to learning martial arts fighting is to divide the body top and bottom. The body consists of two triangles, one from the tan tien to the feet, and upside down above that, from the tan tien to the shoulders. The arms are separate geometrical figures extending from the base of the top triangle. To master martial arts fighting exercises, if your partner attacks with feet, you must back up, if he attacks with hands, you must block. The reason you get out of the way of the feet is because they are larger and stronger than the arms, and you should avoid blocking something large with something small. Obviously, as you get better and better, this will change, and you will eventually be able to handle feet with good solid blocks. The third step in learning martial arts freestlye techniques is to divide the body right side and left side. You must become aware of whether the attack is angling towards one side of your body or the other. This will enable you to push his arms across his body (close) or to move them out from the body (open), which stifles his attack, or opens the targets of his body. At first you can simply face each other and attack with either the right hand or the left hand, and perceive which side he is using. After you have built up enough experience to detect which side he will attack with you will begin to see how to close his attack or open it. In the end, everything depends upon perception. You must open your eyes and become aware of your attacker, study him throughout every motion. These three steps are at the heart of learning how to do martial arts freestyle. Here’s a video to help you learn how to do Karate Freestyle. This article has been focused on martial arts freestyle. Got a friend? Let them know! Five Steps to True Karate!